Putative gap junctions between pyramidal axons have been reported in the hippocampus as well as the neocortex. These gap junctions are indicated in very fast oscillations (VFOs, > 80 Hz) in slow-wave sleep as well as in seizures. They could also play a role in gamma oscillations (30–80 Hz) in the hippocampus and other areas. Computational modeling studies have yielded results consistent with these hypotheses [1–3]. We explore, in greater detail than in previous studies, the parameter dependence of the dynamics of a random neuronal network with axo-axonal gap junctions. First, we analyze propagation through a network of axons (without somata and dendrites). We vary excitation levels and gap junction conductances, and study regimes of disorderly behavior, stimulus-driven VFOs, and re-entrant VFOs (that is, VFOs that persist after the stimulus is removed). We also show examples of spontaneous (noise-driven) toggling of the network between qualitatively different oscillatory regimes. Second, we add intrinsically bursting somata, and analyze the behavior of the resulting system in light of our study of the isolated axonal plexus. Finally, we discuss links between gap junction dependent activity in the axonal plexus, very fast oscillations, and gamma oscillations. An example of re-entrant VFOs vs. stimulus-driven VFOs. Each red dot stands for when an axon spiked. 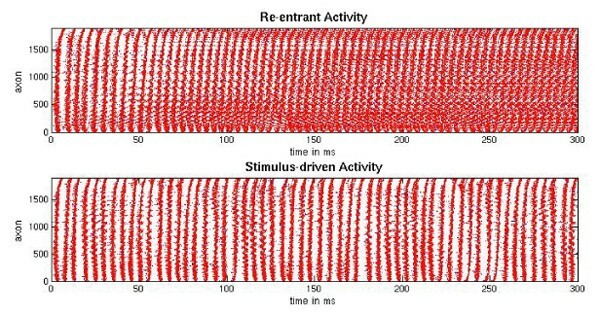 Notice the similarity between each wave of activity for the re-entrant VFOs, while each wave is unique for the stimulus-driven VFOs.